Comm Eye Health Vol. 22 No. 70 2009 pp s03 - s04 (online supplement). Published online 01 June 2009. Oculoplastic surgery in high-income countries is now recognised as a rapidly evolving and expanding subspecialty. In low- and middle-income countries, however, most oculoplastic surgery is performed by general ophthalmologists with varying levels of surgical training and experience. 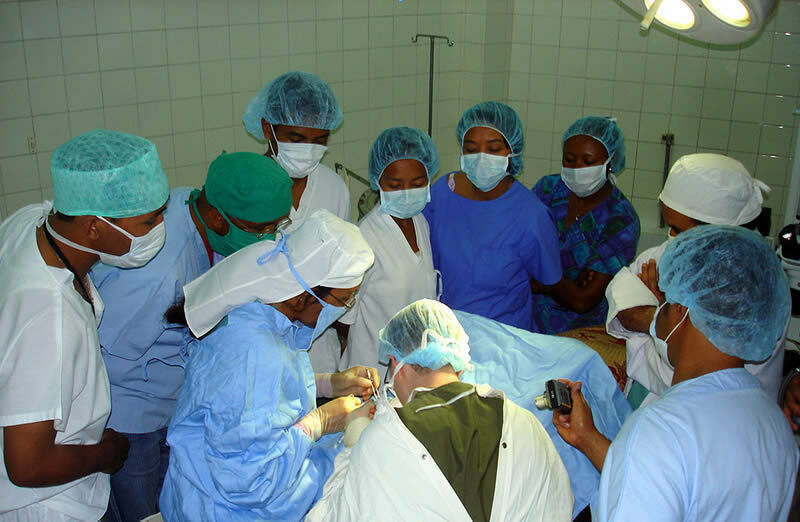 The aim of this study was to review the oculoplastic practices in Madagascar, including the nature of presenting disease and the surgical procedures performed. The study formed part of the initial phase of a training link between Madagascar and Leeds University Teaching Hospitals Trust. We hoped to identify areas of practice that required more specific surgical training. To our knowledge, this is one of the first studies looking specifically at oculoplastic disease prevalence in Madagascar or any African country. The training link was established between Madagascar and Leeds in 2008 under the auspices of the VISION 2020 Links Programme run by the International Centre for Eye Health and supported by the Overseas Partnering and Training Initiative (OPTIN). A memorandum of understanding was signed by the Madagascar Ministry of Health, the University of Antananarivo, the Malagasy Lutheran Church Health Department, and Leeds University Teaching Hospitals Trust. The first part of our study consisted of circulating a questionnaire to fifteen ophthalmologists from six eye departments throughout Madagascar. The questionnaire listed oculoplastic procedures related to eyelid, lacrimal, and orbital surgery and ophthalmologists were requested to indicate, from memory, the numbers of each procedure performed in the preceding eighteen months (from April 2007 to October 2008). The practitioners reported performing 359 oculoplastic procedures in total. Eye removal, both evisceration and enucleation. accounted for 49 per cent of all procedures performed. Orbital implants (for example, coral implants) were rare due to cost. Nearly 20 per cent of procedures involved inserting a secondary conformer or prosthesis. The least common procedures included ptosis, lacrimal surgery (punctoplasty and dacryocystorhinostomy), and entropion correction; only five surgeons had used skin grafting. Seventy five per cent of all procedures were performed by ophthalmologists based in the capital. In the second part of the study, we surveyed all ophthalmologists and related practitioners present at the Madagascan Ophthalmology Society meeting in 2008 (n=33) about surgical interventions for ectropion, entropion, and ptosis. Of the ophthalmic practitioners who had reviewed ectropion, only 16.6 per cent had performed corrective surgery. Of those who had reviewed entropion and ptosis, 22.7 per cent and 14.2 per cent, respectively, had performed corrective surgery (Figure 2). For the third part of the study, we reviewed 23 patients who had been collected for us to see in a single day at a government hospital in Antananarivo, the capital of Madagascar (the tertiary ophthalmic referral centre in the country). Table 1 shows the pathology seen. We performed surgery on nine of the patients. Procedures included traumatic lid reconstruction surgery (with free grafts, transposition flaps, and Z-plasty), prolene brow suspensions, upper lid ectropion correction with anterior lamellar repositioning, and lower lid entropion correction and orbital dermis fat graft for postenucleation socket syndrome (PESS). During each procedure, we gave specific training to the local ophthalmic practitioners present. Malagasy ophthalmic practitioners have now begun to perform some of the above procedures. Patients in Madagascar are more susceptible to post-enucleation socket syndrome (PESS) because of the lack of orbital implants. Training in both eye removal and orbital dermis fat grafting should help improve practice in the future. Given the limited resources, lacrimal surgery is rarely performed, presumably because lacrimal pathology is rarely life or sight threatening. Ectropion, entropion, and ptosis are present in Madagascar, but few are corrected surgically. The results for entropion surgery (22.7 per cent) are similar to those for bilamellar tarsal rotation for trichiasis (24.6 per cent) in a study of leprosy patients in Nigeria.6 In our study, the low surgical coverage was felt to be mainly due to lack of patient awareness. We believe a lack of specific surgical training should also be considered a factor. We understand that this three-part study was limited by the fact that some of the data obtained regarding oculoplastic procedures was from the practitioner’s memory as opposed to a formal log book. However, we feel that we have gained a broad understanding of the current oculoplastic practice in terms of both quantity and breadth of surgical technique. This will allow us to plan future visits and target specific training needs. We would like to thank Miss Marcia Zondervan from the International Centre for Eye Health for her help and the Four Acre Trust for their funding of this linkage programme. 1 Adeoye AO, Onakpoya OH. Indication for eye removal in Ile-Ife, Nigeria. Afr J Med Med Sci 2007;36(4): 371-5. 2 Klauss V, Chana HS. Ocular tumors in Africa. Soc Sci Med 1983;17(22): 1743-50. 3 Chuka-Okosa CM, Uche NJ, Kizor-Akaraiwe NN. Orbito-ocular neoplasms in Enugu, South-Eastern Nigeria. West Afr J Med 2008;27(3):144-7. 4 Nwosu SN. Destructive ophthalmic surgical procedures in Onitsha, Nigeria. Niger Postgrad Med J 2005;12(1): 53-6. 5 Bilyk JR. Enucleation, evisceration, and sympathetic ophthalmia. Curr Opin Ophthalmol 2000;11(5): 372-86. 6 Mpyet C, Hogeweg M. Lid surgery in patients affected with leprosy in North-Eastern Nigeria: are their needs being met? Trop Doct 2006;36(1): 11-3.